STORY: Addis was the most powerful gang in Southtown. Its leader, a man known only as Fate, was considered a modern-day Robin Hood to the poor and downtrodden. He himself had adopted two twin brothers, Alba and Soiree Meira, and trained them to be successors to his legacy. 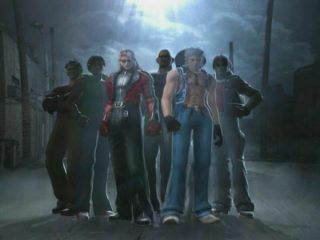 Six months before the in-game events, Fate is killed by Duke, the leader of the up-and-coming Mephistopheles gang. Duke then proceeds to exploit the poor to serve his own twisted thirst for power. In the present day, the Mephistopheles Fighting Tournament is beginning, with the venue being all of Southtown. The participants ( Minus the Meira Brothers and Lien.) believe that the tournament is being sponsored by a charity organization known as the Metatron Foundation, but they soon learn that its true sponsor is the Mephistopheles gang. However for Alba Soiree and Lien they are contacted directly by Hyena so they know Metatron has nothing to do with this. 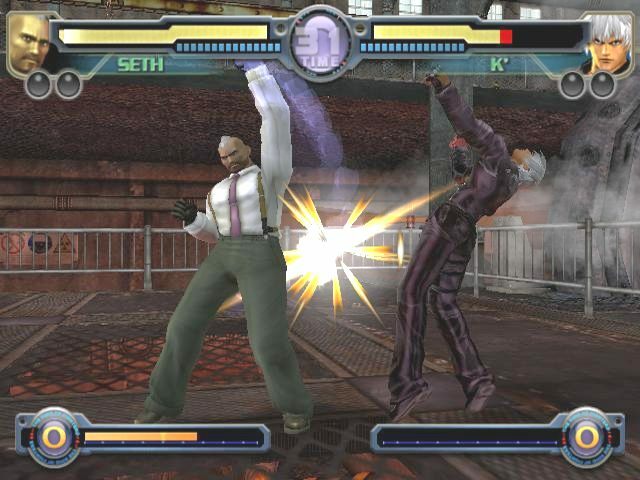 REVIEW: King of Fighters: Maximum Impact is the first game in the long-running KOF series featuring 3D graphics. While 3D graphics are a somewhat refreshing visual overhaul for the series, considering the "aged" 2D character sprites we know and love, so much can go wrong when transitioning a 2D fighter into the 3D realm. 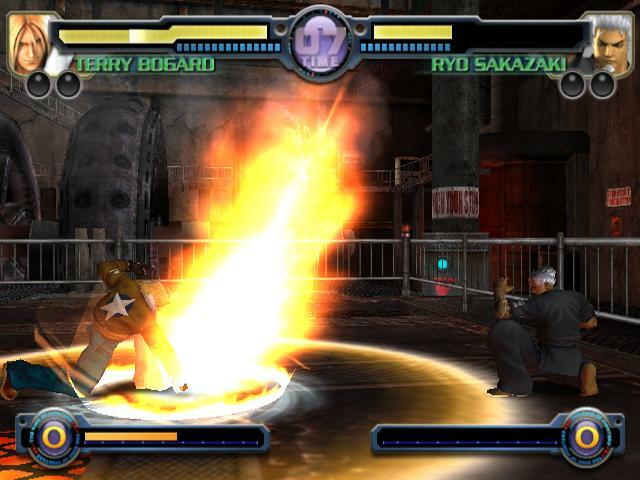 Before we even get to the graphics, KOF: Maximum Impact is plagued with an undeniable flaw right off the bat: the character voices are dubbed in English, with no Japanese dialogue option. (Honestly, that right there killed the entire game for me). To make matters worse, the characters sound nothing like their original Japanese voice actors... a terrible terrible mistake, one which really put a damper on the game for longtime fans of the series. Yes, there's always the mute button... but this is a review. So now that the game's biggest flaw is out of the way, let's see what else Maximum Impact has to offer. Maximum Impact has some cool moments... but only some. 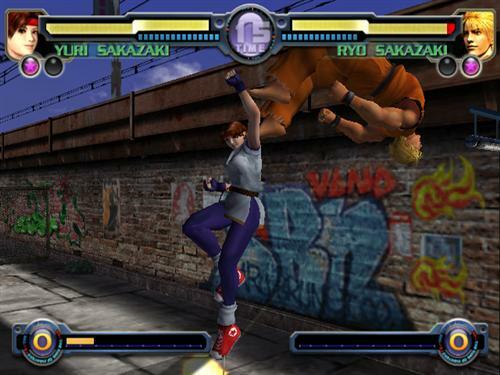 Maximum Impact's gameplay actually does manage to feel somewhat like the 2D KOF we know and love, mainly due to the quick pace of the gameplay. 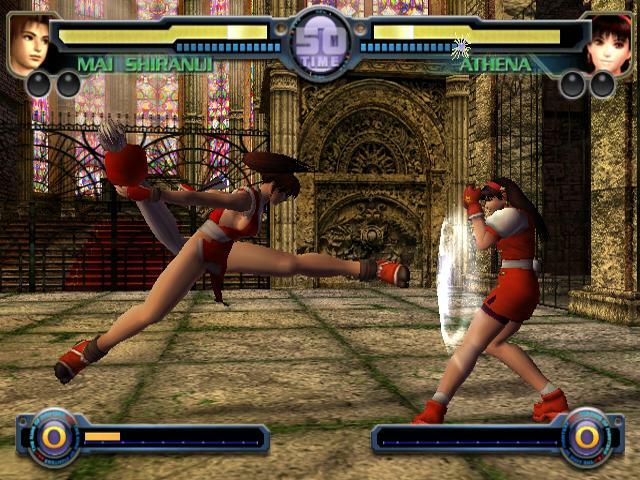 Returning characters retain most of their classic moves (and even frame counts for some moves), but animations in general appear pretty stiff in 3D. 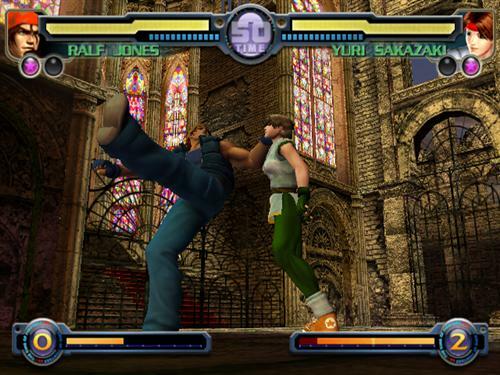 While those frame counts might have worked in a 2D fighting game, that's not to say they'll work the same in 3D. Some moves simply look horrible, but other classic attacks are animated fairly well and do look like they hurt when they connect (particularly super moves). 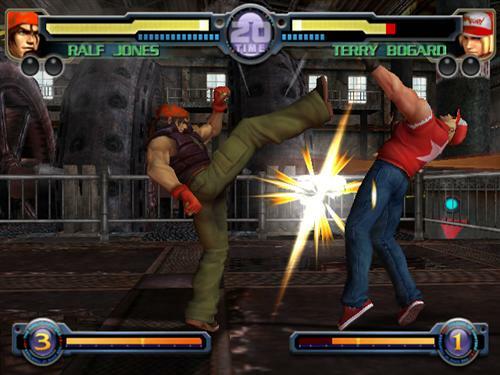 The combo system is pretty simple... possibly too simple, because there are a ton of cheap "pick up" combos in the game, such as Terry Bogard's Power Dunk, or K's uppercut (which can be done 3 times in a row and hit a grounded opponent... guaranteed I believe. Hey, it's good for a laugh at least). 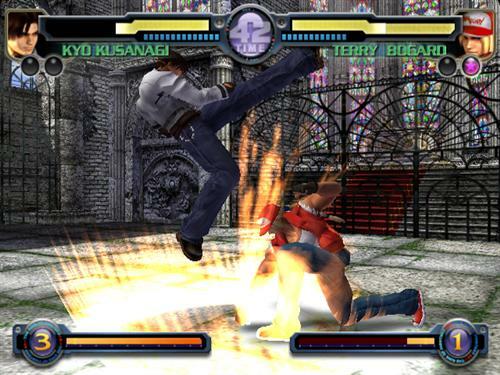 As a 3D fighting game, Maximum Impact doesn't do much right, and doesn't bring out what the KOF series is respected for. The character roster is really small when compared to nearly all of the prequels, another big flaw. The Story Mode is borderline retarded... due to the fact that a weird, no-name freak in a lime green suit (Hyena) orders you around and tells you who to fight next. 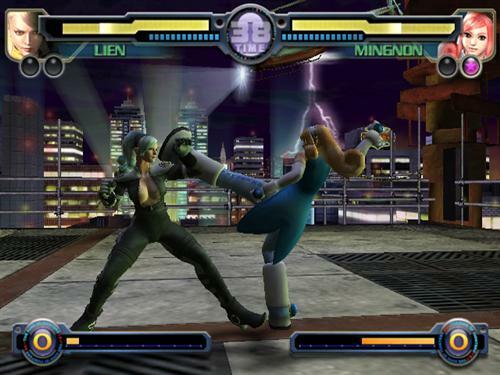 Did that ever happen in a previous KOF game? No... it didn't The new character designs introduced are a mixed bag, but in general aren't that great. One thing's for sure, the newcomers definitely don't succeed the many classic characters that are sadly missing from the game. Furthermore, the lack of many fan-favorite classics in Maximum Impact leaves so much to be desired (This flaw was somewhat remedied later in Maximum Impact 2 and Maximum Impact: Regulation A). SNK threw in a few extra modes besides your staple Arcade & Versus Modes, such as: Mission Mode, which is a challenge at least. 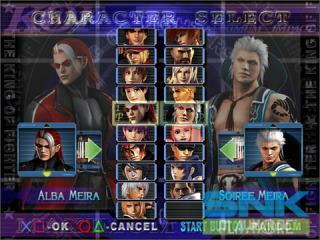 There's even a sort of poor man's customize mode, where you can select a "Rigging Model" for each character... ( WTF is a rigging model anyway?) *In best Bill O'Reily voice* I don't know what that means!!!!! Is this 3D model-making software? No... it's not. Anyway, so this "rigging model" thing changes your characters' appearance by adding a some ridiculous and/or silly items to their outfit or changing it all together. This results in some very awkward or completely dumb looking costumes (whose idea was this???). Okay, so a few of the alternate and bonus costumes for classic characters are worth a look, but sorry... they don't give any sort of reason to play this game. 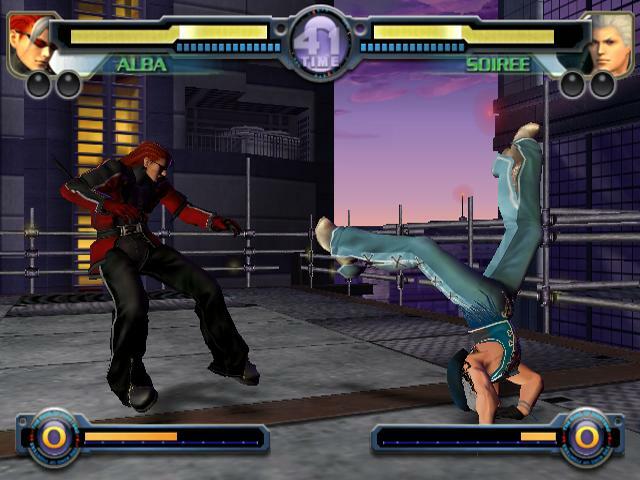 At the end of the day, KOF: Maximum Impact is pretty lame... but hey, "nice try" SNK. While some fans might find something to enjoy about Maximum Impact, let's face it... 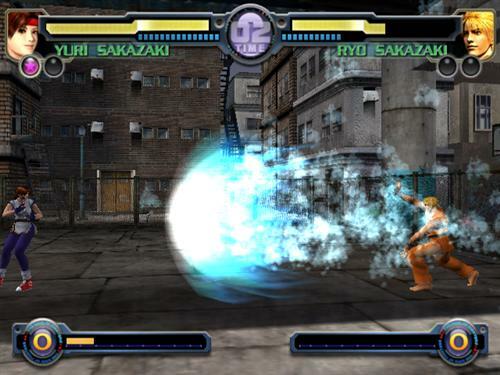 Maximum Impact fails as a 3D fighting game and doesn't come close to living up to the classic 2D titles. I suppose if you're new to KOF, you might not be so nitpicky and could possibly find something to like about the characters. 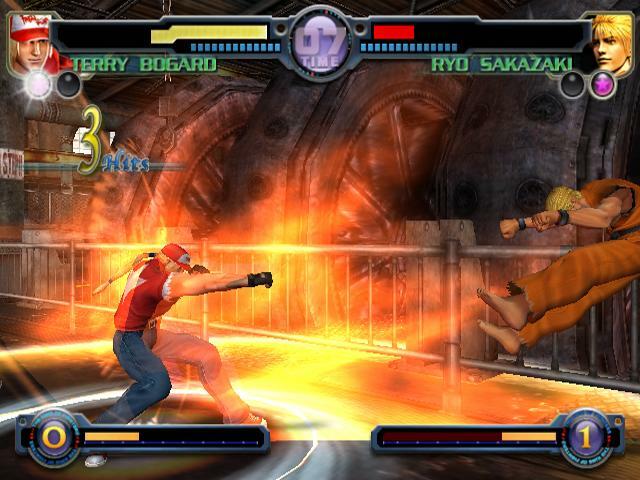 At least, icons like Kyo Kusanagi & Terry Bogard still manage to look cool most of the time.